The Caterham F1 Team, recently put into administration and missing from the grid in the last two races (USA and Brazil), has come up with a novel solution to its cash woes – crowdfunding. The team, sold by Tan Sri Tony Fernandes to a consortium of Swiss and Middle Eastern investors in July, wants to race in the Abu Dhabi season finale on November 23, and has rolled out the #RefuelCaterhamF1 project, reaching out to fans and supporters for help. 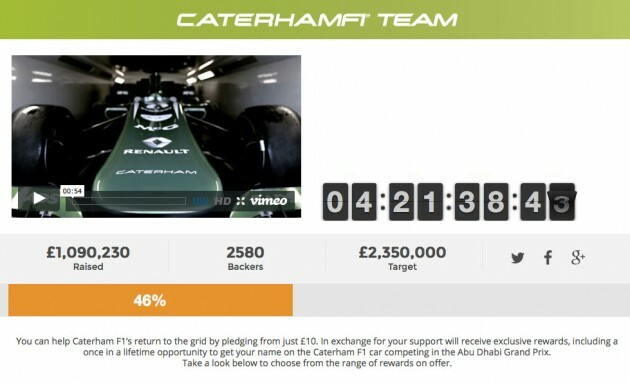 One can do his part by heading to www.crowdcube.com/caterham and pledging an amount from £5 (RM26.45). The team says that supporters will receive unique rewards for their money, from support badges and T-shirts to an opportunity to get their name on the CT05 car in Abu Dhabi. Front/rear wings and nose cones have been “sold out” as are driver’s boots, gloves and team overalls. There are still 71 pieces of used carbon fibre brake discs, though! The initiative will close when it reaches its £2.35 million (RM12.43 million) funding target or on November 14, whichever is sooner. If the target is not hit by this Friday, pledged funds will be returned. Backers can also choose to retain the rewards they have already funded. Finbarr O’Connell, Caterham Sports Limited administrator and interim Caterham F1 Team Principal said: “Everyone involved is incredibly grateful and excited to have raised over £1m of support in less than 48 hours. The team is almost half way to its funding target. I am not packing my toothbrush as yet though and there is still a lot of fundraising to be done. “However, it is clear that this campaign is becoming international and I have been contacted by media organisations from all over the world since Friday. The team have been approached by a number of people and organisations who have offered their support in different ways – from Simon Ward, the artist, offering to produce an original artwork, and 500 prints of it, to trading partners who are offering their support as they want to see Caterham F1 Team back on the grid,” he said. Not very sustainable, you say. “Clearly, the plan is not to run a F1 team by using crowdfunding but rather this funding is providing a stepping stone for the team to a new financially sound future. If teams don’t race they are at a huge disadvantage as regards a potential purchaser making a very expensive purchase decision and this project gives the team the ability to showcase itself and especially its cars,” O’Connell explained. The administrator revealed that “a new financially sound interested party” is considering acquiring the team, and the new interest is wholly due to the crowdfunding campaign. This is something unheard of in sport so far, and F1 supremo Bernie Ecclestone isn’t pleased with it. “I think it’s a disaster. We don’t want begging bowls. If people can’t afford to be in Formula 1, they have to find something else to do. If I sit in a poker game and I can’t afford to be there with the other people, I get killed and have to leave,” he remarked. Meanwhile Marussia, the other team went into administration last month, has folded after talks with two potential investors did not bear fruit. Over 200 staff have been made redundant. And to think that Tan Sri Fernandes once chastised Petronas for signing as sponsors for Mercedes and not Caterham. Kudos to Petronas management for making the right call. Else we would be sucked into paying for a non-racing team outfit as TS Tony offload the team and laugh to the bank. And Petronas is left with a legally binding contract with a bottom feeder team. One is the world champion, and the other is barely alive. Good sensible choice, Petronas. Come on, Caterham, only request RM12.43 mil for funding? It is not even 1% (0.7% to be precise) of what Proton asking from Malaysian government (RM1600mil)! Dei. Sikit-sikit Proton, sikit-sikit Proton. Don’t you get tired of mentioning them? If participate in 1 race cost too much, then why should the whole nation helping a FRGGING company surviving with their useless and poorly built car. Only 1 YES: Syok Sendiri. if they cant afford it then dont participate…might work out in dubai , how about next season…?? I can’t believe that Tony just abandoned the team like that. The team was a failure from the start, and now he just cut all strings that attached him to the team and tweets his whole life about QPR not even once mentioning the sh*t that he left in Caterham to be cleaned up. I think this is quite a creative marketing campaign to raise fund. TF wasting time and money. First, named as Lotus Racing. Fight for Team Lotus at court. Ends now enter into F1 administration.